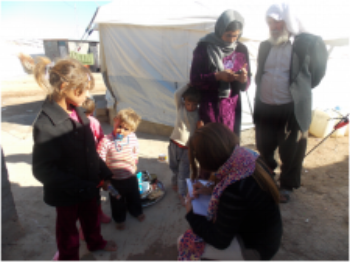 Last month, Alicja Zasadowska, an intern with the Iraqi Kurdistan Team and I accompanied our partners, the Zhyan group, to Duhok to visit the Khanke IDP Camp, about a seven hour drive through the mountains. The Khanke camp is currently the home to several thousand families, mostly Ezidi/Yazidi from the Shangal Mountain (“Sinjar” in Arabic.) According to others who had traveled there earlier in the fall, the families are recovering well given the circumstances, but you can still see the scars of where they were sunburned from spending days on the mountain with no shelter or water. This visit was truly one of the most humbling experiences of my life to date. We spent a weekend collecting the names of 961 women kidnapped by ISIS (we noted the names of men on a separate sheet). I am sure we could have collected many more names had time allowed. 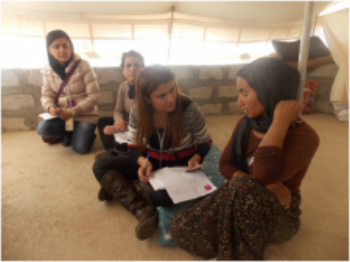 We simply went from one UNHCR* tent to the next, sat with families, and heard their stories. One man with whom we spoke has sixty-six missing family members, another twenty-eight. At times, it felt like the grief and the list of names would never end. Even as the sun set on us and the camp closed for the evening, we heard of more buses on their way to the camp from Kobane, Syria. Along with sharing the names of their family members, people expressed their concerns about the weather. One man shared with us that he had “family that died because they couldn't escape ISIS, family that died on the mountain, family that died on the long walk to the camp, and now those that survived will die in their UN tents from the cold.” Winter is fast approaching; the nights are already down to 42 degrees Fahrenheit/ 6 Celsius. The families are no longer allowed to have heaters in their tents because two tents burned down due to a heater fire that killed two adults and three children. The Kurdish Regional Government and the UN are trying to come up with solutions but are losing to the pace of the oncoming weather changes. Even among this sorrow, children played soccer, braided one another's hair and hugged teddy bears and dolls. Parents held babies, cooked what food they could and folded blankets neatly. Life continues and hope continues where it can.